Filing taxes can be overwhelming, but if you file taxes, chances are that you will get money back! Read on to learn more about if you should file, and how you should do it. You only have to file taxes if you earned more than $6,340 in a year. But if you worked at a job that already withheld taxes, you should file because you might be able to get money back. The first step to doing your taxes is to get your W-2 form, which proves how much money you earned at each job, and how much money in taxes you have already paid. If you had more than one job over the past year, make sure to get your W-2 from each employer. The company you worked for should send you a W-2 by January 31st, but contact them if they don't. Filing taxes can be complicated and confusing, but an expert can help make sure that you get all the money you're entitled to. So don't go it alone! One important way to get help is to set up an appointment with the Volunteer Income Tax Assistance (VITA) program, which provides in-person tax assistance to anyone who makes less than $54,000 per year. If you're a student, many colleges also have student groups or professors who can help students with taxes. If your household income is less than $66,000, you can use the IRS's Free File program, so beware of anyone who tells you that there is a fee to file. Scammers may also steal your identity to get your refund, and even access to your bank accounts. So if anyone calls or emails you offering to do your taxes, be skeptical, and do some research to make sure that they are associated with a reputable organization, such as your city government, your university, or the Volunteer Income Tax Assistance Program. If you're going to school — and paying for it — you can deduct certain education expenses. A deduction reduces the amount of tax taken out of your paychecks, and education deductions can save you as much as $4,000. Know if you are a "Dependent"
Dependents cannot claim any exemptions when filing their own taxes, even if their parents do not claim them either. So anyone helping you with your tax returns will ask if your parent(s) claim you as a dependent on their tax return. If you are not a full-time student, and you're over 19, you are not a dependent, but if you're a full-time college student, you may be. If possible, If possible, talk to your parent(s) to find out if they claim you as a dependent. The deadline for filing taxes is generally April 15th (or sometimes a bit later if April 15th falls on a Sunday), but it can take time to gather your W-2 forms and get an appointment with someone to help you prepare your taxes. Tax-prep companies may offer you a loan on your refund, but beware. These loans may come with interest, or on a prepaid debit card with fees. If you can possibly hold out, simply file online and have your refund deposited directly into your bank account. 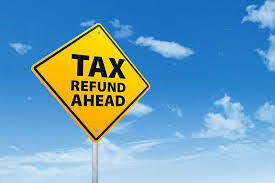 You should get your refund within three weeks - and you might even get your refund in as little as ten days.